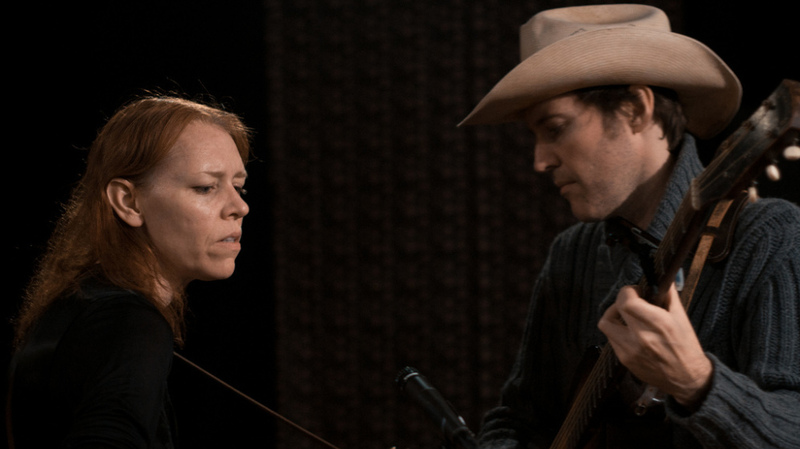 Gillian Welch: Stark, Mysterious Beauty Welch and her frequent collaborator, David Rawlings, share songs from The Harrow & The Harvest. Gillian Welch and David Rawlings share songs from her newest album, The Harrow & The Harvest. Sometimes one microphone and two guitars is all you need — especially when the two musicians using them are Gillian Welch and David Rawlings. That's how the duo recently shared songs from Welch's newest album, The Harrow & The Harvest, during a return trip to WFUV in New York. The Harrow & The Harvest is a stark beauty, recorded alone in Welch and Rawlings' home studio. It's simply arranged but powerful, and one of my favorite albums of 2011. Welch describes the 10-song album as "10 kinds of sad," but it's much more than that. "It's a very unguarded album, very intimate," she says here. "I think this is the closest to what it sounds like in the living room." Lyrically, the songs paint pictures of a bygone era ("Did she leave him for that swell? "), and the vocabulary naturally and authentically reflects that of a small-town world, even though Welch was born in New York City in the '60s. Like she's done before, Welch hints at her own life's mysteries: her biological parents. There are also hints of California (her adoptive parents worked on The Carol Burnett Show when she was growing up) and Nashville, where Welch and Rawlings currently live. All put together, it's a beautiful set of story-songs that could happen anywhere, at any time. Welch and Rawlings share an old-fashioned aesthetic that extends beyond their music, but they're not throwbacks. They travel with a turntable, on the constant hunt for records across the country. In fact, their guest DJ pick at the end of our session was from a recent roadside find. They believe in the intimate magic of live radio, and perform as if families were gathering around to listen. You'll have to use your imagination to picture Welch clapping and dancing on a wooden board during "Six White Horses," and making the most of a gorgeous pair of custom-made cowboy boots. Invoke the theater of your mind to see the duo with closed eyes, so quiet during "Dark Turn of Mind" that the air lies still between each line.